South Korea's top economic and monetary policymakers met Monday to discuss an array of economic issues, such as the growing trade tussle between the United States and China and sluggish job creation. 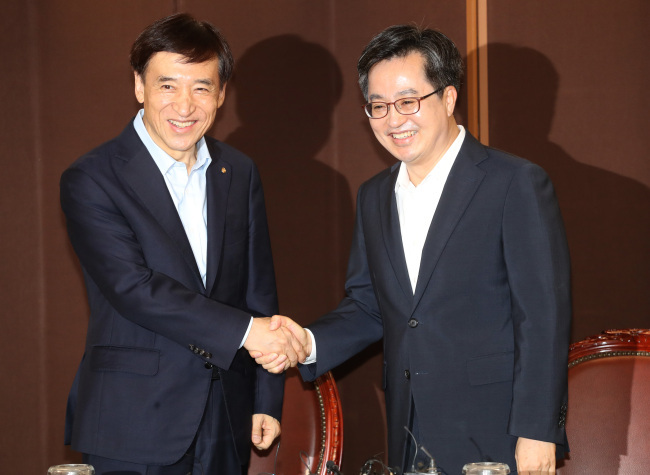 The meeting between Finance Minister Kim Dong-yeon and Bank of Korea Gov. Lee Ju-yeol is their seventh round of policy talks since Kim took office in June of last year. Other senior officials from the finance ministry and the central bank also attended the gathering. "We are looking at potential downside risks, and will discuss trade conflicts and other economic issues," Kim said. Gov. Lee also said the global trade war may have a considerable impact on exports, investment and employment in South Korea. The world's two largest economies have been at loggerheads over trade, leading to global repercussions. In its latest salvo against China, the United States last week unveiled an additional list of tariffs on $200 billion worth of Chinese goods. The action came just days after Washington levied punitive duties on $34 billion worth of Chinese products and Beijing threatened to retaliate with equivalent tariffs on American goods. The US and China are South Korea's top two trading partners. The Kim-Lee meeting also came as Asia's fourth-largest economy is facing headwinds at home as well, such as a slowdown in facility investment and private spending. Also, weak job creation is one of the sticky issues for policymakers here, with job creation numbers hovering at a disappointing 100,000 per month for five straight months. Last week, the central bank adjusted its earlier growth forecast for the year down by 0.1 percentage point to 2.9 percent, citing rising economic uncertainties at home and abroad.